The need for digital citizenship programs to be developed in schools has been ongoing since the mid-1990s. So nearly 20 years on, why have so few schools actively developed policies and programs to support the education of primary and secondary students as digital citizens? Is it because your school does not have one or more teachers who are champions of digital citizenship to lead such an agenda? Possibly. Is this because it should be designed as a cross-disciplinary program and it is difficult to get buy-in of teachers across learning areas and year levels? Probably. Is it because a school does not have a strong digital learning culture with ubiquitous access to digital technologies? Maybe. Is it because it is not an essential part of a 21st century curriculum? Definitely not! In fact the Australian Curriculum does have digital citizenship issues, skills and dispositions infused throughout learning areas and across year levels. The most obvious and immediate place to start exploring digital citizenship in the Australian Curriculum is the Information and Communication Technology (ICT) capability. "In the Australian Curriculum, students develop ICT capability as they learn to use ICT effectively and appropriately to access, create and communicate information and ideas, solve problems and work collaboratively in all learning areas at school, and in their lives beyond school. The capability involves students in learning to make the most of the digital technologies available to them, adapting to new ways of doing things as technologies evolve and limiting the risks to themselves and others in a digital environment." The ICT capability learning continuum is organised into five interrelated elements, some of which are central to developing a digital citizenship program. For example, to help develop students’ capability in applying social and ethical protocols and practices when using ICT, all teachers (no matter what their learning area or year level) need to work with students to recognise the existence and importance of intellectual property. Students need to recognise ownership of digital products that others produce and acknowledge when they use a part or whole of a digital work created by someone else. This involves a school establishing a set of conventions for referencing (appropriately recording bibliographic details of sources at the end of their work), citing (identifying those aspects of a student’s work that has been drawn directly from the work of others), checking for permissions and legal obligations before publishing work (understanding Creative Commons licensing), and strategies for avoiding plagiarism. According to ACARA (2013), students as young as the Foundation Year are required to recognise ownership over their own digital work, i.e., recognising that they own text, photos and videos they produce. Thus, the expectation that a school’s set of conventions with regard to intellectual property are implemented with students as early as their first year of schooling, and sustained as they progress through to Year 10 and/or 12. Other ICT capabilities forming the basis of a digital citizenship program includes students’ ability to apply digital information security practices, apply personal security protocols, evaluate information for authenticity, select digital tools based on functionality and appropriateness, safely and respectfully collaborate with others online, and understand appropriate communication protocols across a range of digital platforms and online communities, just to name a few. The key here is for all teachers to maintain a consistent approach to these digital citizenship practices across learning areas and year levels. This will help students develop the necessary skills and understandings to functional effectively, safely and ethically when engaging with information, people and technologies as 'connected learners'. A school’s digital citizenship program can support teachers in achieving this by clearly articulating how these practices are developed in more sophisticated ways as students graduate to the next year level. The challenge, however, is that a school needs to have one or more teachers who can lead the development of a customised digital citizenship program to meet the specific needs of their school community, and given this requires a cross-disciplinary approach, for a program like this to succeed requires the buy-in of teachers across all learning areas and year levels. A school-based professional learning program on integrating digital citizenship knowledge and skills across the curriculum is also essential. This workshop is designed to provide teachers, teacher librarians, curriculum and e-learning coordinators with an opportunity to interrogate the Australian Curriculum for digital citizenship knowledge and skills outcomes across learning areas and general capabilities for each year level. Participants will be introduced to the breadth of these understandings and skills using Ribble’s (2011) nine elements. These include: digital access, digital commerce, digital communication, digital literacy, digital etiquette, digital law, digital rights and responsibilities, digital health and wellness, and digital security. It is expected that participants undertake an audit of Australian Curriculum for digital citizenship knowledge and skills in either one learning area across year levels, or across a number of learning areas for one year level, as part of the hands-on component of the workshop. School teams of 2-5 participants are encouraged to enrol as their school’s Digital Citizenship Working Party. This can lead to a school planning and implementing a school based program to effectively address their community’s digital citizenship issues and challenges. If you can't make it to the Sydney workshop, join us online for our series of two Digital Citizenship Online Extension Courses. Each term in 2016, the Syba Academy is running a 4 week online extension course on digital citizenship in schools. This series of two courses are designed to provide teachers, teacher librarians and learning technology coordinators with an opportunity to develop digital citizenship policy and programs to address the specific needs of their school community. Develop a matrix of relevant Australian Curriculum content and skills to underpin a school-based digital citizenship program. Upon completion of this course, participants will be eligible for 15 hours of NSWIT/AITSL endorsed credit of professional learning at proficient teacher level or 5 hours of TQI ACT accredited professional learning at graduate, proficient, highly accomplished or lead teacher level. This course is designed to ensure that schools start planning and developing a digital citizenship program, with the view to implement and evaluate the program by the end of 2016. Undertaking this course will help your school make this happen. For more information, please visit www.sybaacademy.com.au/learning/online-extension-courses. Use this set of 6 laminated Digital Tools to Support the ICT Capability Posters to create awareness and guide students in the ICT Capability in the Australian Curriculum. This poster set includes five elements together with selected Web 2.0 tools to support each of the elements. 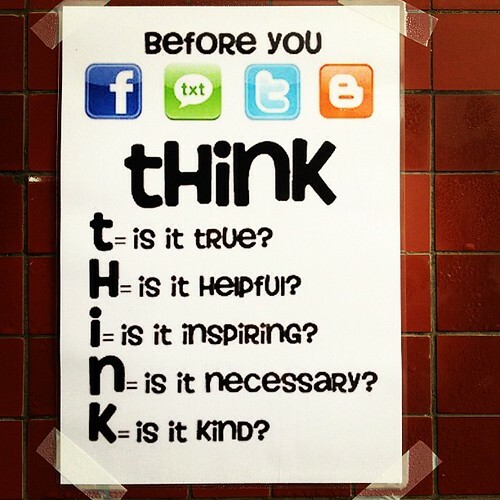 Use our range of digital footprint posters, banners, digital signage, wall graphics, library mats and word walls to create awareness and to assist students in understanding and managing their own digital footprints and respecting others digital footprints.